There were so many unique things about Winona + Gavin's wedding that will make it so memorable. If you know us, we love and appreciate culture very much, so one thing that we had in common with this couple was that! We are a mixed culture couple as they are so we were able to relate in many ways. We loved seeing all the Chinese decor and details throughout the wedding day. Winona was the sweetest and most calm bride. 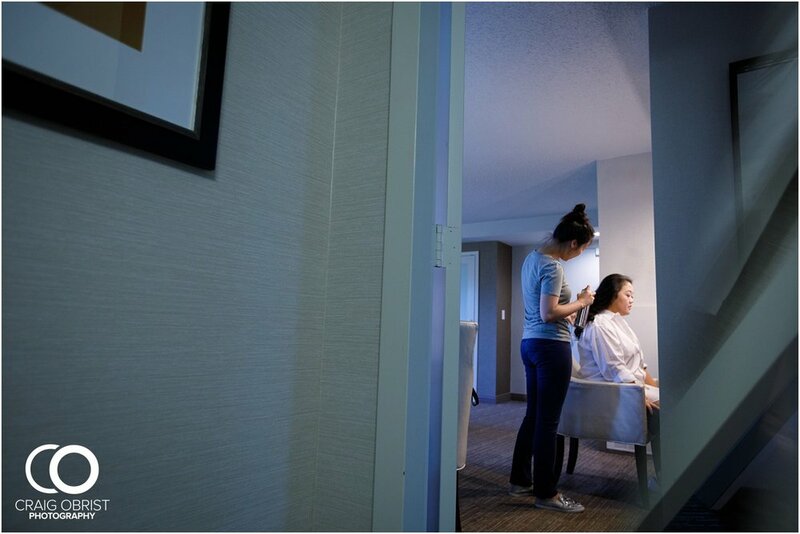 Her getting ready room was with just family and her best friend and it was quite peaceful. If you're Georgia, you know that we've been having a lot of rain this summer, but not on Winona's wedding day! It was a little hot, but we'll take it when there's no rain! :) And... can we talk about her dress a little? She got it from China and it was so unique and beautiful! The blush flowers embroidered were something I have not seen before. Her veil had these flowers as well and more importantly, she looked so awesome in it! Gavin was all smiles when he saw his bride walk down the aisle. And, did I mention that he went to GA Tech? Yes, he did and I'm very proud to say that that's my alma mater and that's another thing we had in common. :) Was very proud that our groom graduated AND works there. He was so kind just like Winona and all of their family. What can I say? All Yellow Jackets are just awesome. ;) Winona + Gavin, we can't thank you guys enough for being amazing clients to us! So happy that we got to know each other more and your parents' anniversary shoot was an icing on the cake! Thank you for trusting us, and we hope you love your photos as much as we do!